Classic. Nostalgic. Genuine. Art inspired by the most beautiful areas of the world. Gérard has a well-earned reputation as one of the most talented and innovative illustrators in commercial art today. From his humble beginnings in France, he worked as an Art Director for an advertising agency in Toronto, and later launched his successful career as a corporate artist. He has patiently created a dazzling portfolio of collections inspired by his travels to the world's most mesmerizing locations; including the breathtaking coastal cities of the French Riviera, the medieval churches of Armenia, the canals of Venice, the waterfronts of major cities in the United States, the ports of the Bahamas, and portrayals of local landmarks and urban areas of Canada's biggest cities, coast to coast. Yerevan Street, from the Armenia collection. Still Life, from the Abstract, Projects & Studies collection. Gérard's confidence in his work has been unwavering. "I spend at least three to four months of every year studying the works of the Masters and learning about the different ways colour and light can combine in my work, absorbing the same play of light and colour that inspired so many of the French impressionists." Church VI, from the Armenia collection. Plate Design for Manufacturer, from the Abstract, Projects & Studies collection. 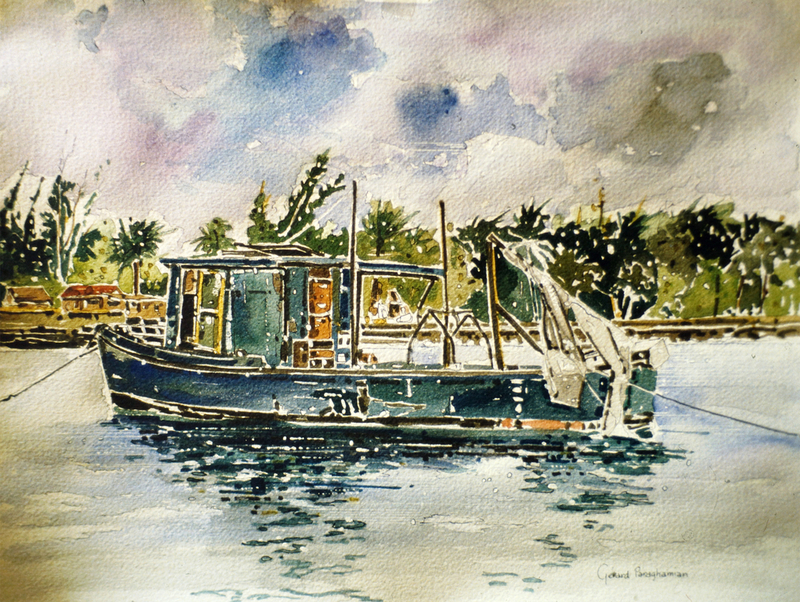 Fishing Boat in Freeport, from the Bahamas collection. Port in Nice, from the Europe & French Riviera collection. Gérard's art has evolved into a mixed media style that is very distinctly his own. The work begins with a strong watercolour base, followed by the sharp contrast of pen and pencil lines, poster paint and felt pen with the occasional dab of acrylic. The results are works that combine impressionism and realism that capture the detail of the image and yet convey a somewhat misty sense of colour and atmosphere through the mood of the image. 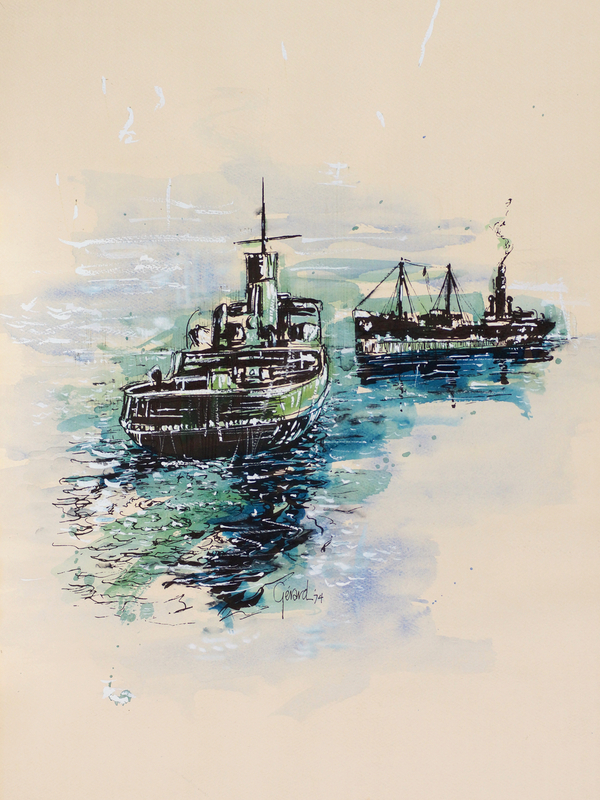 In his recent paintings, there are no unabsorbed details to deter from the pictorial impact of the compositions. This, in effect, is the essence of a truly creative artist. Woodbine Racetrack, from the Canada collection. "We see through our eyes, and not with them. The mind does the seeing and evaluates a visual experience according to its degree of visual awareness," he says. Front at Bay, from the Canada collection. He began painting with oils, then, in the late 1970's, shifted to watercolours. "I didn't feel that oils were challenging enough." Gérard explains that mistakes in oil paintings can be covered up, but with watercolour, it is impossible. No other medium can achieve such a clean impact of luminosity. Rendez-Vous, from the Canada collection. Stormy Weather, from the United States collection. Venice, from the Europe & French Riviera collection. Having travelled six of the world's seven continents, Gérard's work exemplifies true impression. His distinct strokes, impressive detail, emotion of colours, and ability to portray depth are a testament to the irreplaceable aspect of drawing through direct inspiration - and making the viewer nostalgic of places they have never been. Lighthouse at Dawn, from the United States collection. Paraghamian has produced sophisticated and detailed representations of the waterfronts of North American cities, including New York, San Francisco, Miami, San Diego, Toronto, Vancouver, and Montréal. They Have emerged as evidence of his unique and widely recognized talents. Rainy Night in Paris, from the Europe & French Riviera collection. Neighbourhoods II, from the Canada collection. Gérard has donated his art to multiple non-profit organization, the biggest one being UNICEF Worldwide (the above painting is one of them). He says, proudly, "This is what makes an artist feel good: the fact that his or her work is raising funds for the needy...and giving visual enjoyment to the general public." He's also received the medal of l'Ordre de la Pléiade, an international award, as a recognition for his philanthropy. Pencil Study II, from the Abstract, Projects & Studies collection. Villefranche, Côte d'Azur, from the Europe & The French Riviera collection.